For information on scheduling the use of this facility please call 731-986-2900. 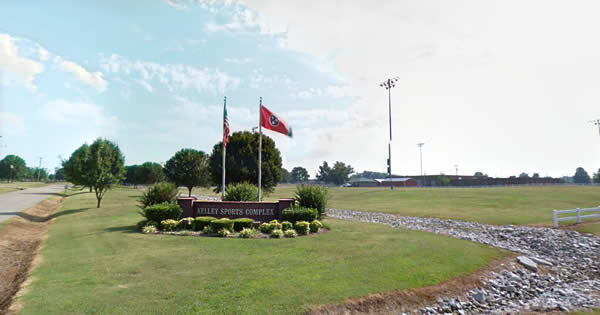 Kelley Sports Complex is a fully developed, 18-acre sports facility which includes four fields to accommodate baseball and softball games, one large multi-purpose field, which will accommodate soccer games, and a walking trail just under one mile in length and a children’s playground. All the ball fields and the walking trail are lighted. A large, centrally located, two-story, multi-sided building houses the concessions, restrooms, and press facilities. There is a smaller concessions/restrooms building at the multi-purpose field. The sports facility began in 1993 with a dream in the mind of Mayor Dale Kelley and a cornfield on the Buena Vista Road in Huntingdon. Planning, engineering, survey work, applications for funding, and many other details were worked out over the course of the next three years. In the Summer of 1996, the cornstalks and scrub trees were cleared, some adjacent land was purchased, and grading of the site began. Bit by bit, the progress was made. Construction continued until the early part of 1999, when the sports facility was officially dedicated. 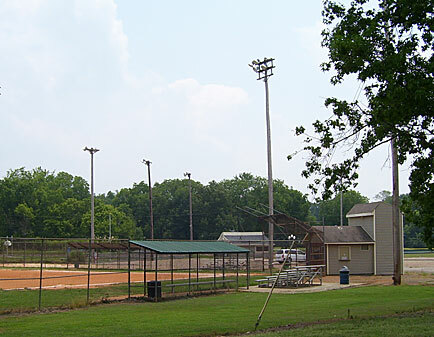 The sports complex was named for Mayor Dale Kelley by an official action of the Town Council in 1998. In 2003, expansions and improvements to the complex began. 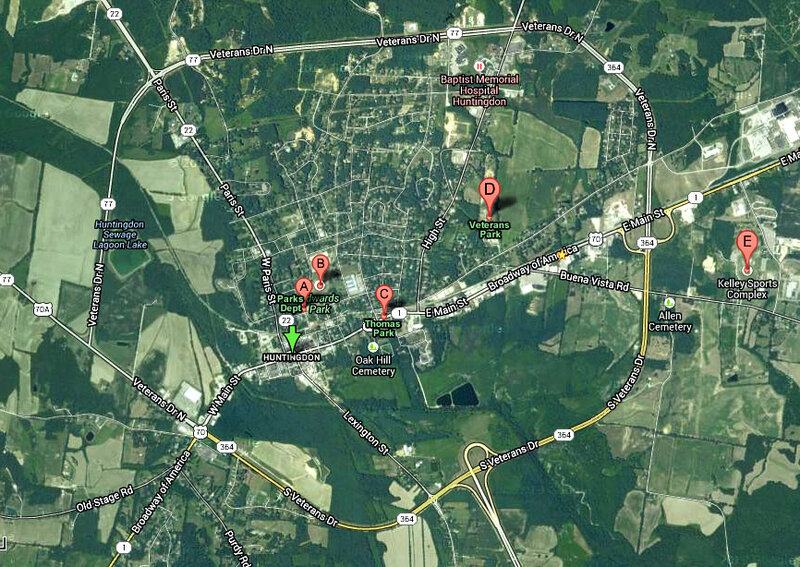 In 2004, Carroll County donated the Sesquicentennial Park to the Town of Huntingdon. This park joins Kelley Sports Complex along a portion of the northeast boundary. A new picnic pavilion is currently under construction at Sesquicentennial Park, named in 1971 for the 150th anniversary of Carroll County. The Kelley Sports Complex Walking Trail is almost one mile in length, with it’s smooth paved walkways and well lit path it has become a popular place for citizens of all ages to exercise. The Complex is clean and the scenery is beautiful year-round with landscaped areas along the trail. No bicycles, skateboards or rollerblades are allowed on the paved trail for the safety of the pedestrians. Come out an enjoy a good cardiovascular workout or just stroll along and take in the scenery, you may even get to watch a baseball, softball or soccer game. 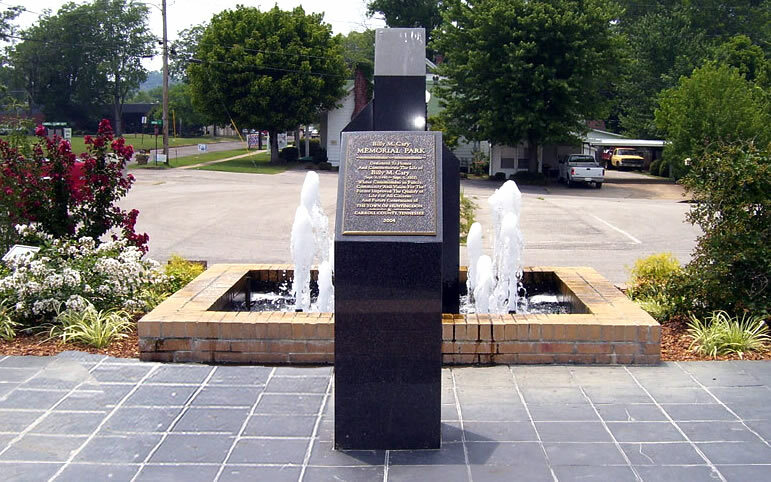 Thomas Park was established in 1906 by a women’s group called the Civic Improvement Club, whose primary objective was the beautification of their hometown, Huntingdon, Tennessee. The group took on the task of making the area on East Main Street around the train depot more enticing to visitors. The area was named in honor of Major John W. Thomas, Sr., president of the Nashville, Chattanooga, and St. Louis Railroad, 1884-1906. The train depot, located in the park until 1967, was the point where many young Carroll County soldiers boarded the train for destinations known and unknown in service to our country. A later group, the Huntingdon Women’s Garden Club, maintained the park and made major improvements in 1985. 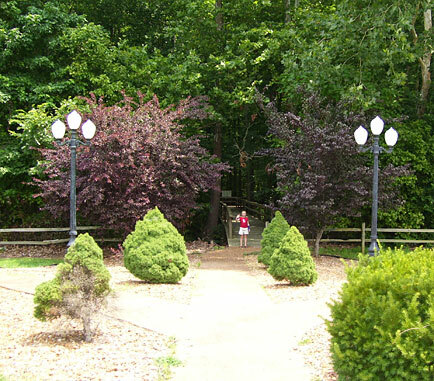 Improvements included landscaping and walkways, funded by the family of Jimmie Lee and Georgia Taylor. The gazebo was funded by the O. B. and Lela Enochs family. In 1993, the Huntingdon Beautification Committee was formed and assisted in the seasonal upkeep of the park. In 1995, CSX Railroad donated the caboose, which was subsequently refurbished for display. Under the leadership of Mayor Dale R. Kelley, the Town of Huntingdon finally acquired legal title to the Thomas Park property from CSX in 1998. Original bricks from the train depot were donated by Elizabeth (Mrs. W. V.) Radford and incorporated into the paved walkway in front of the caboose. 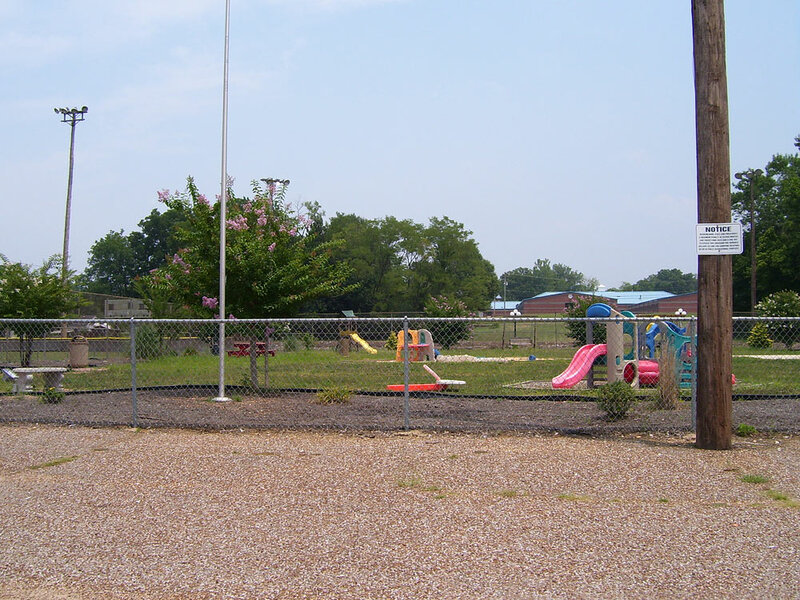 Further renovations to the park by the Town of Huntingdon in the year 2000 were also made possible by local donations. 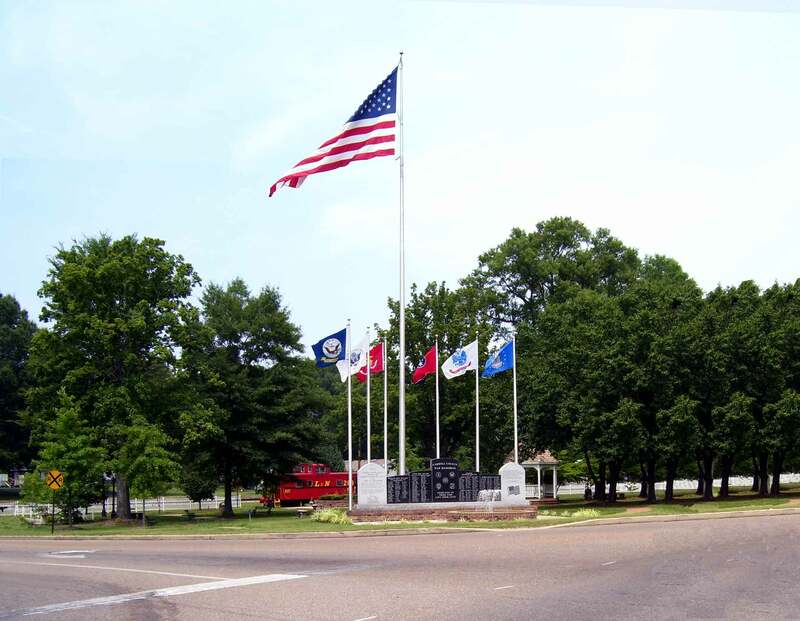 Carroll Bank & Trust, trustee for the Wright Charitable Trust, contributed funds for the memorial monument, the fountain, and flag poles located in the southwest corner of the park. The memorial honors all Veterans and is inscribed with the names of Carroll County soldiers who died while serving in the wars of our country. Woodmen of the World Lodge #445 donated the first giant American flag to fly at the memorial monument. Friends and family of Danny and Joyce Carter donated two marble benches and two lampposts. Additional lamppost donations were made in memory of former Mayor Lee H. Chance and Dorothy Ellis. Richard and Carolyn Brooks donated the decorative clock at the east end of the park. The successful completion of the improvements at Thomas Park in 2001 is due to these generous donations and to the dedicated efforts of the Town of Huntingdon employees. We commend their talents and hard work in making Thomas Park a beautiful and impressive focal point of our community. 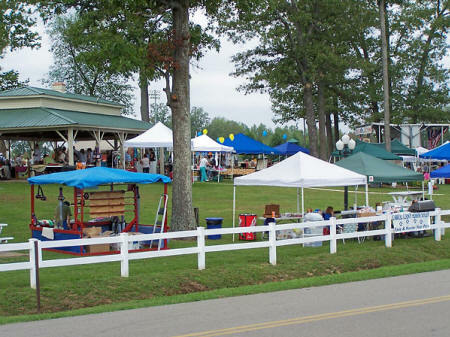 Located across from the Carroll County Civic Center in Huntingdon and adjacent to Kelley Sports Complex, Sesquicentennial Park has served as the site for the Heritage Festival in years past and boasts pavilions, picnic tables, restroom facilities and plenty of space for a crowd. Relay for Life event at Veterans Park. 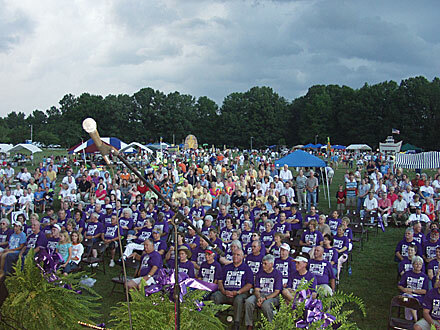 Veterans Park is the site of the annual Relay for Life event and much more! Ball field at Edwards Park. One of the playing fields at Edwards Park. The fenced playground at Edwards Park. Other parks in Huntingdon exist to add beauty and character to our town. Among these are the Billy Cary Memorial Park located on West Main Street across the street from Carroll Bank & Trust and the boardwalk and greens park area also located on West Main. Billy Cary Memorial Park. Adjacent to this memorial is a lovely, small park with picnic pavilion, playground equipment with slides, and swings.